In the midst of rolling green countryside near Münstermaifeld, Germany, sits a castle that would fulfill many a young girl’s dreams of where she, the princess that she is, should live. This mesmerizing castle, hidden in a valley away from view from the roads above, is the medieval castle Burg Eltz (or Eltz Castle). Burg Eltz is visually different, both inside and out, from most of the castles in Rheinland-Pfalz. While walking through its oddly-shaped rooms and courtyard, the aura of long-departed lords and ladies, knights and damsels, and servants and tradesmen going about their daily lives within its walls is ever-present. The colorful banners, portraits, furniture, armor, shields, artwork, and heraldic symbols that fill the castle and its grounds harken back to the castle’s early heritage. According to the Burg Eltz website, the name “Eltz” first appeared in 1157, when the name “Rudolf zu Eltz” was recorded as a witness to a deed written by Emperor Frederick I. 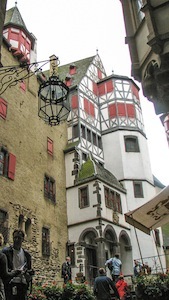 The exact date when construction began is not known, but the first stones were most likely laid between the 11th and 13th centuries, during the Hohenstaufen dynasty, with rooms added to the structure over five centuries. Although this vertically rambling structure rises 230 feet above the Eltz River that surrounds it on three sides, using a rock outcropping as its foundation, Burg Eltz was used primarily as a home rather than as a fortress throughout its history, with as many as 100 full-time residents living in its 100-plus rooms during various periods. The geographic site chosen for the castle was economically strategic for the time, taking advantage of one of the most important Imperial business and trade routes of the day, the Mosel River. Fortunately — and nearly unique among Germany’s medieval castles — Burg Eltz sustained no damage during the many wars and foreign occupations experienced over the centuries in what is now modern Germany, allowing the castle to be viewed today as it was originally built. Equally notable, for over 800 years the castle has been owned by at least one member of the Eltz family. Representing the family’s 33rd generation, the current owner, Dr. Karl Graf von und zu Eltz (also known as Faust von Stromberg), resides full time elsewhere in Germany with his wife and children. However, the family actively uses the castle, adding their own personal touches such as family photos and flower arrangements created by the current duchess herself with flowers from her own gardens. Open annually from April through the end of October, the castle grounds also host two restaurants and a souvenir shop. Delicious pastries served with coffee and wines from the Burg Eltz winery are special treats on offer. Burg Eltz is just a short distance from the Münstermaifeld town center in Rheinland-Pfalz, an easy drive from Cologne, Bonn, or Trier. For more information, including hours of operation and directions to this historical castle, visit http://www.burg-eltz.de.